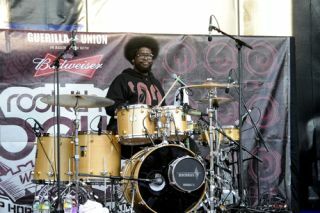 ?uestlove continues to be one of the drumming community's most prolific, as well as coolest, members as he links up with the ever-controversial Amy Winehouse. The Roots sticksman, who has recently recorded an album with John Mayer, told Spinner Music that the duo are set to work together - although the fact Winehouse cannot enter the US is proving something of a stumbling block. He said: "It's just that we have to work overtime to get her visa situation together. The closest she can come to the States is Jamaica." The pair are planning to meet up when ?uestlove visits France later this year, and until then they have been keeping in touch through Skype. ?uestlove making use of the latest hi-tech wizardry to talk to the 'Rehab' singer shouldn't come as a great surprise, after all he recently confessed his love for Twitter.